That is the precept of The Miracle League Association. Helping children with mental and physical disabilities play the game of baseball with the assistance of buddies, there are currently over 250 Miracle League Organizations across the country and over 200,000 children and young adults with disabilities participating in these leagues. 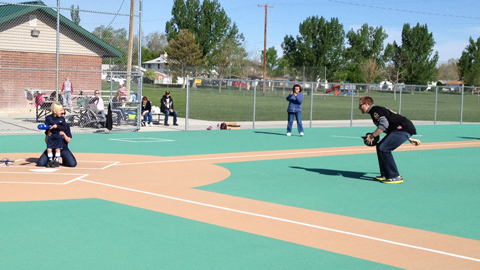 Last Saturday morning, three Bees players participated as buddies with two teams in Salt Lake’s Miracle League. Outfielder Doug Deeds and right-handed pitchers Matt Meyer and Loek Van Mil took turns pitching, helping in the field and encouraging the youth as they made their way around the bases. After the game, each of the kids received a baseball autographed by the players and took pictures with the players. For more information about the Miracle League visit miracleleague.com. For the third year in a row, the Rhode Island Department of Health recognized the PawSox with the Rhode Island Occupational Safety and Health Administration (OSHA) program’s “Safe Place for Teens to Work” certification. 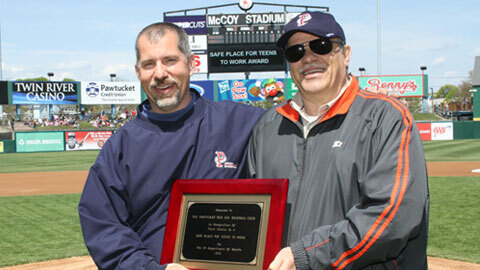 The PawSox were honored for their “outstanding workplace health and safety management that address the unique issues of young workers”. PawSox VP of Staduim Operations Mick Tedesco (left) received the OSHA plaque from Tony Cabral, the Senior Industrial Hygenist for the OSHA Consultation Program and the RI Dept. of Health, in a ceremony prior to the PawSox game on April 25 at McCoy. PawSox Vice-President accepts an award from the R.I. Department of Health. 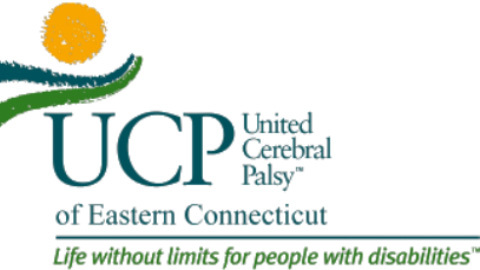 NORWICH, CT-The Connecticut Tigers and United Cerebral Palsy (UCP) of Eastern Connecticut have joined together to help New London resident and former Assistant Waterford Baseball Coach Michael Loper raise funds to help make his home more accessible. Loper, a client of UCP, has been unable to live an active life since undergoing spinal fusion surgery eight years ago to help relieve symptoms of Cerebral Palsy. He and members of the Connecticut Tigers Front Office staff will be selling tickets to the Tigers game on Saturday, July 21 against Lowell at 7:05 p.m. at the Waterford Little League South Opening Day this Saturday, April 28. The ticket sales will begin at 8:00 a.m. at the field on Gardiner’s Wood Road. Half of all ticket sales will go to helping Michael’s cause. Tickets are currently available at the following locations around Eastern Connecticut: Sportee’s in Waterford, (262 Boston Post Road # 9); Picardi’s Pub in Waterford, (120 Boston Post Road); and at Angie’s Pizza in Mystic (25 Roosevelt Avenue). Those interested in helping promote Michael’s cause are asked to call Michelle Bussolotti at UCP of Eastern Connecticut directly at 860-443-3800, extension 11. Michael will also be available along with members of UCP at the game on July 21 to take donations and talk with fans interested in helping his cause. The Tigers will also hold a ceremonial first pitch on July 21 honoring individuals that helped Michael’s fundraising effort. The Connecticut Tigers are the Class-A affiliate of the Detroit Tigers and play in the New York-Penn League. The Tigers saw a 23% increase in attendance in 2011 (the 4th highest in Minor League Baseball), and will open their third season at Dodd Stadium on June 20 against the Lowell Spinners, affiliate of the Boston Red Sox. Season tickets, suite rentals, and group outings are currently on sale. For more information go online to cttigers.com or call 860-887-7962. PULASKI, VA – Last Friday at the Pulaski Country Club was a jam-packed, fun-filled day of golf, silent auctions, food, and chances to interact with standout athletes with roots in Southwest Virginia. Billy Wagner and Shayne Graham were on hand throughout most of the morning to promote the Second Chance Learning Center (SCLC) charity and to meet-and-greet with participants in the morning and throughout the early afternoon.The winning team from the entire tournament consisted of Kenny Myers, Matt Williams, Butch White, and John Hawley. 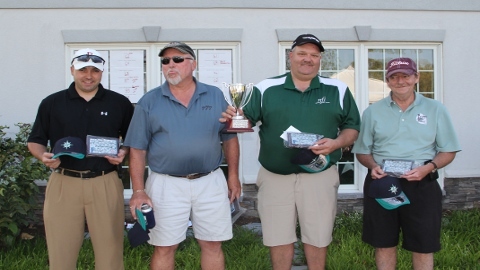 The foursome finished with a score of 56 to win the tournament, but the biggest win of the day was raising over $6,400 for the Second Chance Learning Center. The Pulaski Mariners would like to thank all participants, sponsors, and everyone who donated to the tournament that helped make the day’s events possible and such a tremendous success. This article originally appeared on the official website of the Pulaski Yankees. Click here to view the original story. 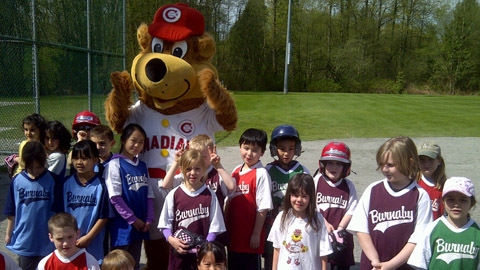 Bob Brown Bear joined Burnaby Minor Softball on Saturday for a little action on the diamond. (Scotiabank Field at Nat Bailey Stadium – Vancouver, BC) – The Vancouver Canadians and mascot Bob Brown Bear made a pair of community appearances on Saturday making stops in Burnaby and Richmond. Did you know the Canadians will turn the lights off out at Scotiabank Field nine times this summer to help promote our BC Hydro Powersmart ‘Nooners at The Nat. Talk about saving energy! Softball (fastpitch) is one of Canada’s fastest growing sports with more than 100,000 kids from coast-to-coast playing games that are just as competitive and enjoyable as baseball. The Vancouver Canadians open up the 2012 home schedule out at Scotiabank Field at Nat Bailey Stadium on Wednesday, June 20th at 7:05pm as the C’s welcome the Tri-City Dust Devils in a re-match of last year’s Northwest League Championship. FORT WAYNE, Ind.. – The wildly popular Bad Apple Dancers of the Fort Wayne TinCaps have been selected as a 2012 Hoosier Hospitality Award recipient. The awards are given by the Indiana Office of Tourism Development. A presentation will be made by Lieutenant Governor Becky Skillman at the Indiana Statehouse on Wednesday, May 9 at 10:30 AM. “We’re incredibly honored to have been selected as one of this year’s award winners. The Bad Apple Dancers are one of the favorite attractions that fans like to see when they come out to Parkview Field, and I give a lot of credit to Brad Shank, Brent Harring and Tyler Baker for the work they’ve put into the Bad Apple Dancers,” said TinCaps President Mike Nutter. The Bad Apple Dancers perform at the end of the sixth inning during all of the 70 TinCaps home games each season at Parkview Field. Hank Conger knows about challenges. The 24-year-old Salt Lake Bees catcher was drafted out of Huntington Beach, Calif., in the first round of the 2006 MLB Draft by the Los Angeles Angels of Anaheim. Conger went from being an 18-year-old kid still living at home to being a professional baseball player out on his own within one month’s time. Thursday, Conger spent part of his morning talking to a group at the Wasatch Youth Center in South Salt Lake about the difficult times he has encountered in professional baseball. Conger also answered questions from the crowd of around 40 youth about topics ranging from how he hits a baseball that comes at him so quickly to how he interacts with his teammates after a win. Bees infielder/designated hitter Paul McAnulty met Wednesday morning with a group of youth at the Decker Lake Youth Center in West Valley City. 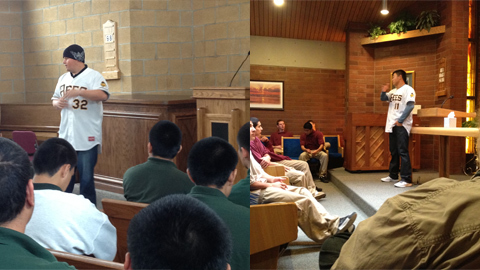 McAnulty talked about choices and how they lead you to where you are. He told the group about his choices, especially those he made earlier in his life, and how they have helped him achieve his dream of playing professional baseball. “Choices lead you to where you are today. Some people might say it was your situation or your circumstance, but I believe you were in that situation or circumstance because of your choices,” said the Oxnard, Calif. native. The Bees are in the fifth year of the team’s mentoring program with Utah’s Juvenile Justice Services (JJS). The program includes player visits to facilities as well as inviting JJS groups to the ballpark for a player-given tour and tickets to a Bees game. Learn from the pros at Hens baseball camps! 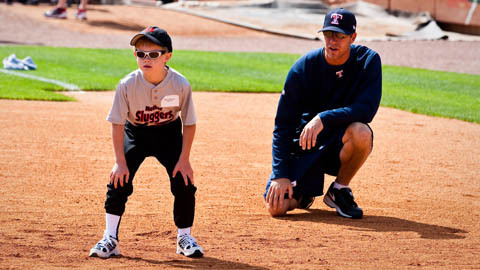 Put the fun in fundamentals at Mud Hens Baseball Camps – presented by Aquafina and BCSN. Choose from two separate three-day camps, a single one-day camp for kids, an adult/child one-day camp and a special needs baseball clinic. Details on each camp can be found here. These camps will sell out, so make your reservation today! During every Mud Hens baseball camp, Mud Hens players and coaches will teach kids what it takes to become the best ballplayer they can be. Campers will learn basic fundamentals (like hitting and pitching) and specialized skills (like bunting and turning double plays). Mud Hens baseball camps are a great way for kids to improve their baseball skills, make new friends and, most importantly, have FUN! Call 419-725-4367 for all the details or click here! Have you seen Bob Brown Bear or Chef Wasabi lately? 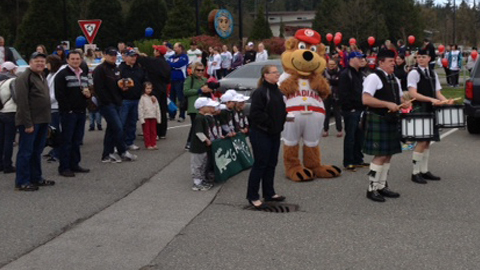 From pipe bands to first pitches, its been a busy week for C’s mascot Bob Brown Bear! (Scotiabank Field at Nat Bailey Stadium – Vancouver, BC) – With spring in the air and kids from all across the Lower Mainland kicking off their Little League seasons, the Vancouver Canadians are out and about cheering on our future stars of the diamond. This past weekend, the C’s were out in full force including stops at Vancouver Minor, South Vancouver, Trout Lake, Little Mountain, White Rock, Forest Hills and New Westminster. As well the Canadians were thrilled to cheer on our little sluggers with Challenger Baseball and out at the Children Hearing and Speech Centre. “It’s a busy time of the year but we couldn’t be happier to get out into the community and see the excitement on all these kid’s faces,” says Vancouver Canadians Manager of Community Relations Jeff Holloway. You can follow the Canadians around the clock at www.facebook.com/vancouvercanadians as well as on twitter at www.twitter.com/vancanadians. If you’ve got a great photo from one of your Little League games or events, send it to us through our social media and we’d love to share it with our great fans! The Canadians open up the 2012 home schedule on Wednesday, June 20th as we host the Tri-City Dust Devils at 7:05pm. For ticket information, give us a call at 604.872.5232 or click on the ticket options at the top of this story. TROY, NY- The Rensselaer County Regional Chamber of Commerce has announced the 2012 winners of their prestigious Van Rensselaer Awards, and the Tri-City ValleyCats are the recipients of the Small Business Award, in recognition of outstanding contributions to area communities. Whether through their partnerships with charitable organizations or the volunteer efforts of their front office staff, the ValleyCats organization recognizes and embraces their responsibility to make a difference in the Capital Region. Appearances include reading at elementary schools and after-school programs, baseball clinics at local youth leagues, charity benefits, numerous walks and 5k’s and more. Fans who donate will receive two tickets to an April or May BlueClaws game. LAKEWOOD, NJ – The BlueClaws are partnering with the Rutgers Against Hunger program and hosting a joint food drive on Wednesday, April 25th. Fans are asked to kindly donate non-perishable food items at this game and all donors will receive two complimentary tickets to a BlueClaws game in April or May. 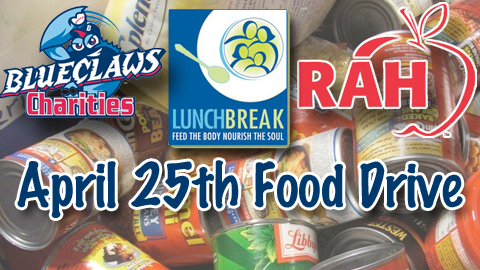 All food collected will be donated to Lunch Break of Red Bank, a BlueClaws Charities Community Partner. The April 25th game begins at 6:35 pm and serves as Community Partner Night at FirstEnergy Park. There will be a large representation at the game among the 45 BlueClaws Charities Community Partners who will have tables on the concourse. Many volunteers from these organizations will be present as well. In addition, the first 2,000 fans will receive a BlueClaws magnetic schedule courtesy of Investors Bank. Rutgers Against Hunger works to increase awareness of hunger, encourage activism and service to tackle hunger, stimulate research to assist those in need, and provide immediate relief through food drives and other events to raise money and collect food. Rutgers Against Hunger partners with the New Jersey Federation of Food Banks which includes The Community FoodBank of New Jersey, the Food Bank of South Jersey, the FoodBank of Monmouth and Ocean Counties, the Mercer Street Friends Food Bank, and NORWESCAP Food Bank as well as several other community food banks and pantries throughout the state. Visit RAH.Rutgers.edu for more information. BlueClaws Charities, the official non-profit foundation of the Lakewood BlueClaws, rasies money throughout the year and returns the money to the community in the form of grants to the 45 Community Partners and donations to other non-profit organizations. 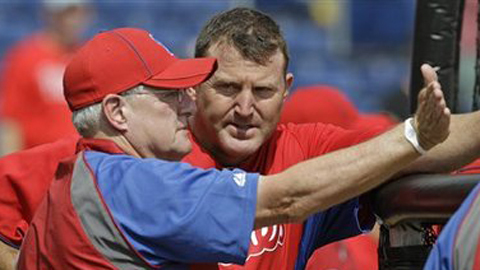 While the program is sold out for 2012, with any questions about the program, to be added to a waiting list for 2013, or for other ways your organization can raise money with the BlueClaws, please call Jim McNamara at 732-901-7000 ext 176. FRESNO, Calif. – The Fresno Grizzlies have announced that its extensive, award-winning Wild About Reading program enrolled over 97,000 students across the Central Valley in 2012, setting a new record for total enrolled students. The seven-year-old program experienced an increase of over 26,000 students from last year’s previous record of 71,000 students. The reading program encourages students to read 10 books in five weeks. If a student reaches the goal, he or she receives two free tickets to a 2012 Grizzlies home game. Students can redeem their tickets for the specific game date designated to their school. This year’s Wild About Reading game dates are April 15, April 20, April 29, May 11, June 3 and June 10. In addition to the goal of reading 10 books, Wild About Reading features an interactive assembly held at schools from as far north as Merced to a southern-most reach of Lemoore. In 2012, Grizzlies mascot Parker, Eddie the Owl from EECU and the Grizzlies front office staff performed the assembly at 165 schools. The program runs for three months from January to March. Wild About Reading is presented by PG&E, National Parks Conservation Association, Educational Employees Credit Union (EECU), Chukchansi Gold Resort & Casino, and Ruiz Foods. The Fresno Grizzlies kick off their 15th season in Fresno on Friday, April 13th when they take on the Tacoma Rainiers, Triple-A affiliate of the Seattle Mariners. Fans are encouraged to Orange Out Opening Day for the 7:05 pm game. Tickets are available through the Chukchansi Park Box Office, online at www.FresnoGrizzlies.com or by calling 559.320.TIXS.